Hotel Parco Torre Chia, Domus de Maria. Parco Torre Chia Hotel Domus de Maria. Newly constructed hotel complex dipped into the green and ideal for those who want to treat themselves to a stay characterised by nature and sport. It has 210 comfortable rooms which provide own patio or private terrace and a very equipped wellbeing center. It is 300 meters far from the beach. Hotel Parco Torre Chia is ideal for those who love nature and activities in the open air and want to treat themselves to a holiday characterized by sea, sun and comfort. Our hotel has a 800 sqm panoramic swimming pool for adults and a smaller one for children. Sport lovers will have at their disposal a five-a-side football field and two tennis courts. Our Wellbeing Center has a wide fitness area and a sector dedicated to wellbeing treatments. The beach dedicated to hotel has of thick grain sand and it is equipped with umbrellas and sun beds free of charge. Free transfer service to several beaches but with beach service for a fee. In the hotel you can book tours, car hire, horse riding and mountain biking. Among the services offered 1 soccer field, 2 tennis courts, 2 pools, gym, hiking, mountain biking and rental cars. Golf is available at Is Molas Golf Club (27 holes). 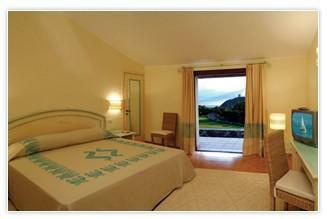 Guests at Hotel Parco Torre Chia will receive an excellent facility costs.